A Digital Video Recorder (DVR) is a device that records video in a digital format to a disk drive. DVRs made specifically for CCTV Security Surveillance System applications record video signals from security cameras. The information, once captured, can be stored and able to be viewed multiple times. Many DVRs are designed to record audio as well. DVRs provide features and services, such as searching video by time/date or camera, that surpass the simple recording of video images. A DVR also offers control over quality and frame rate or overwrite security footage that is deemed no longer crucial, allowing disk space use to be maximized. In some DVR security systems, remote control and access to security footage is possible by connecting the DVR to either the internet or a LAN network. Some of the latest security digital video recorders include video analytics software and firmware, enabling functionality such as following suspects or objects throughout your surveillance system to the detection of abandoned objects. Security DVRs may be categorized as being either PC based or embedded. A PC based DVR's architecture consists of a PC with operating system and a video capture card designed to capture video. An embedded DVR is designed as a single unit with its operating system and software contained in the firmware or read only memory. A Network Video Recorder, or NVR is an internet protocol (IP) based device that sits on your computer network. Since the NVR sits on your computer network, Network Video Recorders can be accessed and managed remotely via your Local Area Network (LAN) or over the Internet, allowing you greater flexibility. One of the basic functions of a NVR is the simultaneous recording and remote access of live video streams from your IP cameras. One the attractions to Network Video Recorders is their ease of use and installation. 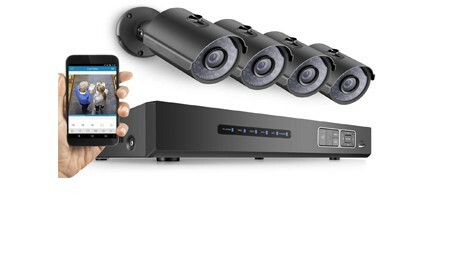 Typically, a Network Video Recorder will feature advanced recording and playback capability, an intuitive remote control unit, a user-friendly graphical user interface (GUI), Intelligent Motion Detection, and PTZ camera control. NVRs are designed to handle the vast amounts of simultaneous video streams coming in for recording and broadcasting the same feed out live to client machines locally or remotely. New generation of NVR hardware are now "open platform" systems. They are NVRs that allow the user to run any IP Recording software on the market. They usually support a Windows or Linux environment. They are now rack mountable units that are at a minimum of 1U in size. These open platform NVRs allow for flexibility and scalability when deploying an enterprise level camera system. The restriction on dedicated hardware are lessened in this new generation of NVRs so that maintenance is kept at an affordable price. Industrial CCTV Cameras Installation, IP CamerasInstallation Los Angeles, HD Cameras Installation Los Angeles.